Walking in the Pas-de-Calais is as natural as breathing. It has to be said that with its 3,000 kilometres of grassy footpaths, the region is well endowed. Take the first step and call the Pas-de-Calais Tourist Board in Wimille! This is not a question but a statement, there are ten times more kilometres of hiking trails in Pas-de-Calais than there are motorways; over three thousand in all. And although hiking on foot is slower, it is far more interesting than watching the scenery fly by from the back of a car. The highlight of the show is of course the Opal Coast. Winding along beaches of fine sand, sheer chalk cliffs, green meadows overlooking the sea, it’s a rambler’s delight… but the countryside is also worth a trip. Bucolic valleys alternate with marshes that you can cross on foot, but also by boat along the canals and ponds ? mare en français. Each of the names of the paths is already an invitation to explore: the bay of Saint-Jean, the Cape Gris-Nez circuit, the Mont Dauphin trail, the Pihem ravine, the Tadpoles route… an enticing programme! Why not try out Nordic walking in the Pas-de-Calais? 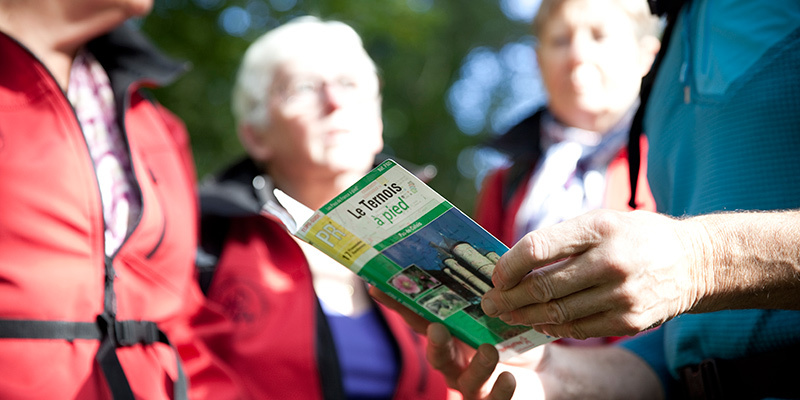 You’ll find the signposted trail in the Parc Départemental d’Olhain set in 200 hectares of lush green countryside.